Summary Provides the steps for configuring your network to use device SSO with RM Unify. RM Cloud Service Delivery can assist you with your RM Unify AD Sync installation. For further information, please speak to your Sales representative on 08450 700 300. RM Unify Network Provisioning, or, RM Unify AD Sync v3. Enable device SSO in RM Unify. Set the RM Unify SSO URL as your Internet browsers' landing page*. Configure Internet browsers to trust https://*.rmunify.com, https://*.google.com and other O365 URLs*. 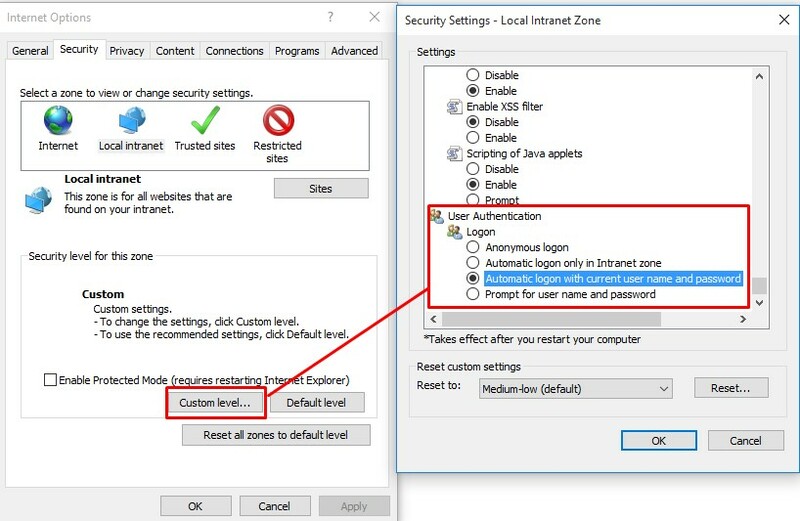 Configure user authentication for 'Local intranet' zone*. Configure website navigation in 'Local intranet'* zone. * Device SSO is compatible with Edge, Internet Explorer and Chrome. You must configure the Internet Explorer security settings, which are shared by Internet Explorer, Edge and Chrome. Changing your browser settings can be achieved via GPO or your usual network management tool. Further details in each section below. Support for device SSO for Azure AD (AAD) joined Windows 10 machines will be coming in a future RM Unify release. This will allow a user to sign in to their Windows 10 device using an AAD account, which will sign them in to RM Unify, and therefore all other joined services, such as Office 365. Further information about this functionality will appear on the RM Unify Roadmap closer to release: https://app.prodpad.com/products/8c63dc10-656f-11e8-9403-5dee1c0f148d/roadmap and on the RM Blog afterwards - http://www.rm.com/blog/categories/rm-unify. RM Unify Network Provisioning. Please refer to TEC5797903 in the Other Useful Articles section below for details. RM Unify AD Sync v3. Please refer to DWN3182456 in the Other Useful Articles section below for instructions on how to install or upgrade your existing version. Navigate to https://launchpad.rmunify.com/ManagementConsole/SSOSettings and tick the 'Enable single sign on' box. To benefit from device SSO, users should navigate to a specific URL based on your school's existing RM Unify scope. This will be the existing scope, appended with /sso. For example, if your school's RM Unify scope is https://school.rmunify.com then your SSO URL will be https://school.rmunify.com/sso. Set the default landing page for your Internet browsers to be your RM Unify SSO URL. Depending on your network type, this could be set via GPO or your usual network management tool. If you have a CC4 network please see TEC1710358 in the Other Useful Articles section below. Otherwise, please contact your usual network support provider for assistance with this. Device SSO currently works with Edge, Internet Explorer and Google Chrome. Add https://*.rmunify.com to the 'Local intranet' zone in your Internet browsers. This will allow the browser to complete automatic login with RM Unify. Depending on your network type, this could be set via GPO or your usual network management tool. If you have a CC4 network please see TEC4698403 in the Other Useful Articles section below. Otherwise, please contact your usual network support provider for assistance with this. Click the Security tab, select the 'Local intranet' zone, click Custom level. Scroll down to find the User Authentication section. Under the Logon sub-section, click the 'Automatic logon with current user name and password' radio button. Depending on your network type, this setting could be made via GPO or your usual network management tool. If you have a CC4 network please see TEC4698403 in the Other Useful Articles section below. Otherwise, please contact your usual network support provider for assistance with this. Scroll down to find the Miscellaneous section. Under 'Websites in less privileged web content zone can navigate into this zone' heading, click Enable. Depending on your network type, this could also be made via GPO or your usual network management tool. If you have a CC4 network, please see TEC4698403 in the Other Useful Articles section below. Otherwise, please contact your usual network support provider for assistance with this. Click Tools, 'Compatibility view settings'. 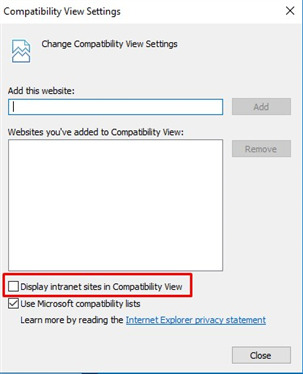 Remove the tick from 'Display intranet sites in Compatibility View'. If the user's RM Unify password does not match with their local network (AD) password, then we will detect this and redirect them to the RM Unify sign in page. RM Unify Network Provisioning: When the user next signs in to RM Unify, their password will be synced to the local network. Alternatively, if the user changes their local network password this will be synced to RM Unify. RM Unify AD Sync: The user must change their local network password and this will be synced to RM Unify. In this type of setup, once device SSO has been enabled at one establishment, it is enabled for all. You will find that the tick box on all relevant RM Unify establishments' SSO Settings page is not ticked, but device SSO will be enabled nonetheless.